The new release Folder Size 2.8.0.0 is packed with new and improved features. The majority of the improvements are related to the print functionality where an advanced Print Preview option is implemented. The flexible new Print Preview dialog will not only let you preview the printed document, but also set margins and page settings, remove pages from print job, rearrange print order and more. There are also several options in the new print dialog that will let you save the print job to a PDF, multi-page TIFF, PPV or EMF file. There is also a new export functionality that will let you export the content of the details view to a CSV format. A tool button near the report type selection is added for this purpose. The standard complete export functionality in the File menu is preserved and extended with the Owner details. Exporting owner details is disabled by default in order to preserve the performance of the tool. If you need this information included your can enable it in File->Options->Export: “Export owner information”. There are also some small bug fixes applied to the new version. You can read the complete list of all the new features and changes in Folder Size 2.8.0.0 here. This entry was posted in Folder Size, News and tagged Analyise Folder Size, Analyze Folder Size, Disk Size, Drive Size, Emf, Export Details View, File, File Size, File Size Scan, Files Report, Folde, Folder Size, Folders Report, Largest Files, Largest Folders, Print Preview, Print To Emf, Print To Pdf, Print To Tiff, Scan Folder Size, Size, Tiff on October 15, 2012 by MindGems Support. 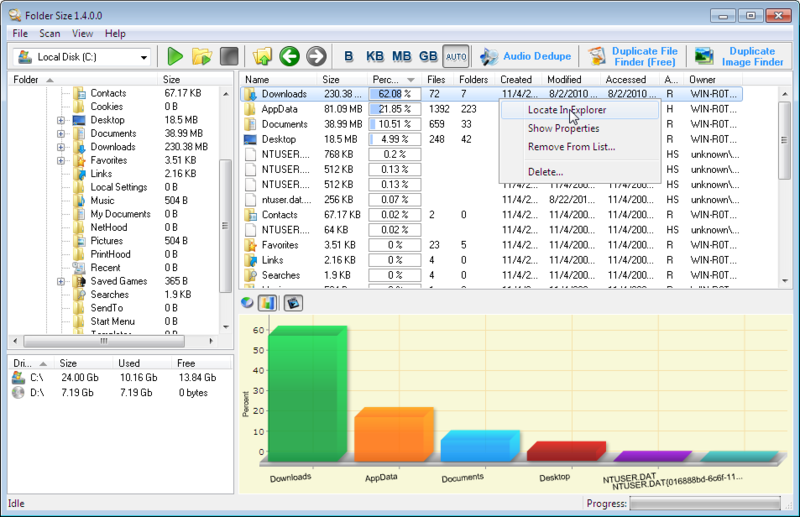 Folder Size 2.6.0.0 – Largest Files & Largest Folders reports. Folder Size 2.6.0.0 adds two new reports to the already available information. The largest files and largest folders report will list the information analyzing all the sub-folders of the selected folder. This means that if you select the root of your drive Folder Size will instantly list the largest files and largest folders that are stored in it regardless of their location. You can now also see the total size of the selected items in the status bar. If there are no items selected the size of all the items listed in the details view will be displayed. The scan of multiple folder via Drag & Drop is also a very handy feature. For example you can use Windows Explorer search in order to find all the folders named “TEMP” then drag the listed results inside Folder Size in order to analyze them. There are also some small bug fixes applied to the new version. You can read the complete list of all the new features and changes in Folder Size 2.6.0.0 here. This entry was posted in Folder Size, News and tagged Analyise Folder Size, Analyze Folder Size, Disk Size, Drive Size, File Size, File Size Scan, Files Report, Folder Size, Folders Report, Largest Files, Largest Folders, Scan Folder Size on July 28, 2012 by MindGems Support.